TOKYO — Japan is expected to announce new defense guidelines next week that would transform its newest warship into an aircraft carrier and pave the way for a major purchase of as many as 147 F-35s, the parliamentary vice minister of defense for Japan’s ruling party said Wednesday. 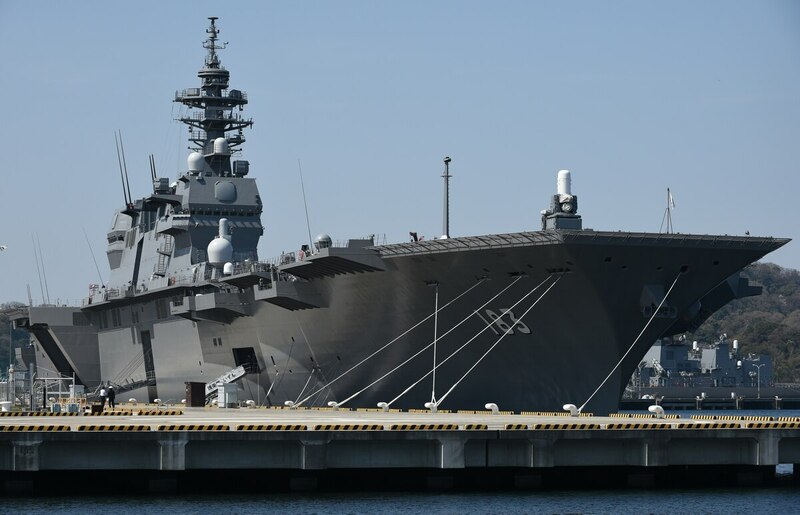 Converting Japan’s newest warship, the JS Izumo helicopter destroyer, into an aircraft carrier that would carry the advanced F-35B vertical takeoff joint strike fighter would mark a major shift in the post-war makeup of Japan’s Maritime Self Defense Forces. Since World War II, Japan has maintained a force exclusively for self defense, however, in the last decade, and particularly after the devastating earthquake and tsunami in Japan in 2011, the country has increased the range of its military engagement to support regional humanitarian missions. Japan activated a new marine unit, the first of its kind since World War II. The transformation of the Izumo would be the next step, making Japan an even more expeditionary force. That shift has been a sensitive political topic domestically, as Japan’s post-World War II constitution forbids it to assume an offensive security posture. The Liberal Democratic Party and Prime Minister Shinzo Abe are expected to release defense guidelines next week that will take that more assertive approach, said Keitaro Ohno, LDP’s parliamentary vice minister for defense. The fundamental shift reflects Japan’s need to defend against its top strategic concern, China’s rapidly expanding reach in the Pacific, Ohno and multiple other Japanese political and military officials said. There is “no need for us to operate such an aircraft carrier if we don’t have to respond to China,” Ohno told U.S. reporters visiting Japan as part of a week-long study program sponsored by the Sasakawa Peace Foundation. Japan is reportedly looking to buy the F-35B short-takeoff-and-vertical-landing model, which would allow it to operate from ships and send a message to China. Transforming the Izumo to be able to support the F-35 won’t cost much, as the new and modern warship, which was commissioned in 2015, already has the basics to support the vertical takeoff fighters, Ohno said. The biggest price tag will be a planned buy of up to 147 F-35s to both outfit the Izumo and replace Japan’s aging fleet of F-4 and F-15 fighters. Ohno said that about 40 of the aircraft would be F-35Bs for the Izumo, and 107 would be F-35As to replace the F-4s and F-15s. Specifically, Ohno said, the administration would seek to purchase 47 F-35As for a one-for-one replacement of its remaining F-4s. Of Japan’s approximately 200 F-15s, Ohno said Japan would keep and upgrade 100 of those airframes, then replace the other 100 with a combination of about 60 F-35As and the 40 F-35Bs. The Izumo was initially designed to carry SH-60 helicopters and conduct primarily regional humanitarian and search and rescue missions. The Izumo carries a crew of about 400 and is roughly the same size as the Wasp-class amphibious assault ship. The new defense guidelines do not commit Japan to the buy, but make it possible for the leading party to move forward on seeking funding for the purchase in the next Diet session. The plan comes amid a larger debate in Japan on the future role and authorities of its defense forces.